Home/Comics/Friday Flash Facts: The Great Race! Friday Flash Facts: The Great Race! The “who is *insert quantifiable comparative trait here*” debate is nearly as old as comic books themselves. Young boys and girls, and adults alike have long participated in back-and-forth discussions over which of their favorite comic book heroes would win over another in an all-out fight, and one can find no shortage of YouTube videos theorizing just that with hundreds of different matchups. If you were to ask most Marvel comics fans, the number one question is likely to be, “Who is (barring Cosmic Entities) the most powerful hero in the Marvel Universe?” For many DC fans, however, the question is quite different; while such a large percentage of Marvel characters are measured based on their physical strength, DC characters can far more often be measured by their fleetness of foot in relation to each other. No question in this line of thought has been more hotly debated throughout the decades of the DC Multiverse, than that of, “Who is faster: the Flash or Superman?” Today we’ll not only bring a full-stop to this specific debate, but we’ll take it a step further even and additionally go through DC Nation Magazine’s recent, official Top Ten Fastest Characters in the DCU list – the first officially recognized list of its kind for the publishing giant. Without further ado, let’s get this Great Race started! First and foremost, let’s run through the topic of Supes versus the Flash; as stated above, the question of who was faster between the Man of Steel and the Fastest Man Alive is as old as the characters themselves during DC’s Silver Age of comics. To get more specific, the Flash we’ll be primarily focusing on the Silver Age Flash, the man who created the Speed Force himself – Barry Allen. Barry and Clark have raced on several occasions, with the first few taking place during 1967’s Superman (Vol.1 ) #199 and The Flash (Vol.1) #175 respectively. Both of these races ended, unsatisfactorily to fan’s ire, in a tie between the two Justice League members. From that point until Barry’s sacrifice in Crisis on Infinite Earths, the Flash and Superman would race several more times, with the ending ratio leaving much to be desired in terms of a definitive answer by which fans could end the debate. Then came 2009’s post-Final Crisis story of The Flash: Rebirth by Geoff Johns and Ethan Van Sciver, that saw the triumphant return of Barry Allen to the land of the living. In addition to slightly rewriting the Silver Age Flash’s origin and revealing the nature of the Speed Force’s as well, the creative pair put the kibosh on the debate once and for all. During the story, Reverse Flash Eobard Thawne’s Negative Speed Force was infecting Barry and he decided to resign himself to imprisonment within the Speed Force once again in order to prevent himself from doing harm to his fellow Flash Family members after having only just been rescued from it by his protégé, Wally West during Final Crisis. As Barry raced across the globe to build up the necessary speed by which to enter the Speed Force, Superman gave chase, not wanting to see his Justice League friend lost to them yet again. Superman stayed hot on Flash’s heels for a short while as he attempted to talk his brother-in-arms down from yet another sacrifice, and reminded Barry that they had raced many times before and he’d even won some of those races (a side note here is that none of these races Supes is remembering having won were ever actually published, so this is either some historical revisionism by the Man of Steel, or the various continuity-altering Crisis events had resulted in some altered history with regards to their past races). With the spark of the peed Force flickering in his eyes, Barry dropped the long-awaited and theorized pipebomb that went off like a jet breaking the sound barrier, “Those were for charity, Clark” and left Superman in the dust with a decisive, resounding “BOOMMM”. The most recent addition to the Flash Family (a fractured but slowly piecing together family at that), Wallace was introduced during DC’s New 52 run of The Flash. He’s Iris West’s nephew and retconned as the original Wally West’s cousin whom he’d never met prior to DC’s Rebirth. Since gaining his Speed Force powers and taking up the mantle of the newest Kid Flash (the third one to be precise), Wallace has improved in his abilities but his youthful arrogance and propensity for making bad decisions that affect others negatively, continually gets in his way. Of all of the Flashes, he’s most certainly the slowest with regards to this list (we’ll have to wait for Jay Garrick and Bart Allen’s true Rebirth re-emergence in order to find out just how accurate that statement is) and his reddish-yellow Speed Force Lightning is reflective of that. As for Willaimson’s reasoning for Wallace (II)’s starting placement on this list, “Wallace is still young and learning how to control his powers-his bravado is still a litter faster than he is. Once he gets a handle on his abilities he has the potential to be the fastest, but it will take some time and experience.” The nature of youthful energy versus experience is on full display with Wallace West (II), and Williamson’s reasoning falls right in-line with it. An interesting entry on this list at all until one realizes that formerly-known “Captain Marvel” SHAZAM can stand toe-to-toe with the likes of the Last Son of Krypton himself as his godlike powers are magical in nature, and magic is one of Superman’s “kryptonite”. SHAZAM’s powers are derived from a number of ancient, mythological gods, one of which being Hermes, by whom he derives his speed specifically. Williamson’s description is as follows, “He’s (SHAZAM) been granted the speed of Hermes and can run as fast as lightning bolts, but even the swiftness of the protector of the Rock of Eternity can’t give him an edge over these speedsters.” So, reasonably, while SHAZAM is no slouch in terms of his speed, his powers encompass far more than just that, and you know what they say about a Jack of all trades being the master of none. The placement of this Barry Allen rival speedster is perplexing at first glance, as numerous times throughout his arc in The Flash (Vol.1) Lightning Strikes Twice he is shown to be measurably faster than Barry even so far as being only the second speedster to show the ability of generating a Speed Force Clone which simulates him having the ability to be in two places at once. However, and Joshua Williamson touches on this if you pay careful attention to his reasoning, August Heart had been perma-stealing the Speed Force energy from all of the other speedsters who were created during the Speed Force Storm, and additionally he’d absorbed some of Barry and Wallace’s energy as well. So at his base level, August may have been incredibly fast, but without the stolen energies he’s still not nearly fast enough to be higher on the list. For Williamson’s quote, “When August first got his powers, he was maybe faster than Barry Allen, but Barry and Wallace siphoned the speed he stole from them. Now that his powers are more in check, Godspeed needs redemption if he’s ever going to tap into his true speed.” Godspeed has since shown signs of a desire for that very redemption in the pages of The Flash, and while he may not be nearly the fastest yet, he’s already proven himself to be capable of great feats of speed and readers should look forward to future appearances of the character. Comic book fans have long-known the princess of Themyscira to be fast, but until Joshua Williamson put her at a higher position on his list, I think precious few of them (myself included) truly understood just how fast Diana could be. To be fair, the focus of Wonder Woman’s comic book adventures has rarely, if ever, been the speed with which she can move, and while the fantastic Wonder Woman film and her appearance in the (less-than-fantastic) Justice League movie did showcase some fleetness of feet, she’s never been shown to be reliant upon that skill. 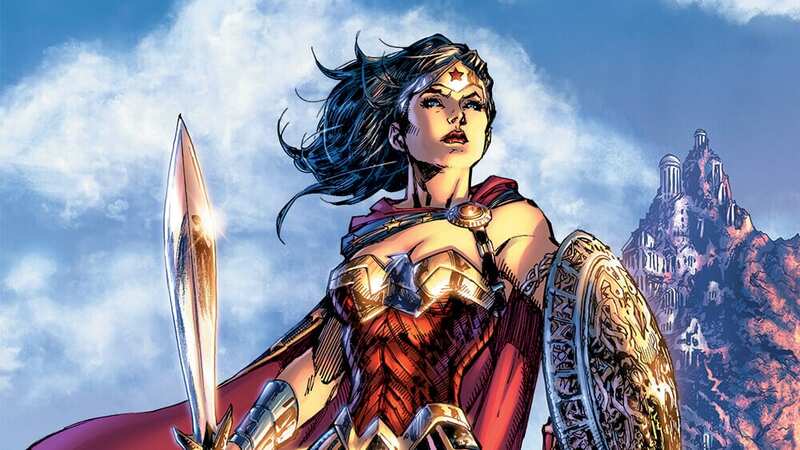 Williamson said it best, however, “Diana is the greatest warrior in the DC Universe. She was trained by the Amazons. She understands the mechanics of running better than anyone on this list, which gives her an edge over the competition.” So while Diana may not be winning any races against the coming entrants on this Top 10 list, she is so familiar with how the human (or demi-god) body functions in movement that she is still capable of squaring off with the best of them. One of Wonder Woman’s most notorious villains, Cheetah has the capability of moving incredibly fast – but to move faster than the likes of Kid Flash, SHAZAM, or Godspeed? I’ll admit, this one threw me for the biggest loop on this list, but as with the aforementioned entrants, Williamson whittled his reasoning down to the instinctual. “She has zero hesitation in her movements and a no-mercy mindset, which helps her stay focused on her goal-a swift kill. Her unrelenting drive makes her one of the fastest threats in the DCU.” In the animal kingdom, cheetahs are as fast as it gets, so it seems a natural fit Cheetah would be a speedy force in the DC Universe. With her being the central villain in the upcoming Wonder Woman 1984 film, hopefully, fans will get the chance to see Cheetah show some truly impressive feats of speed against our favorite warrior demi-goddess! Going back to the earlier discussion, this should come as no real surprise to the Last Son of Krypton high but not the highest. 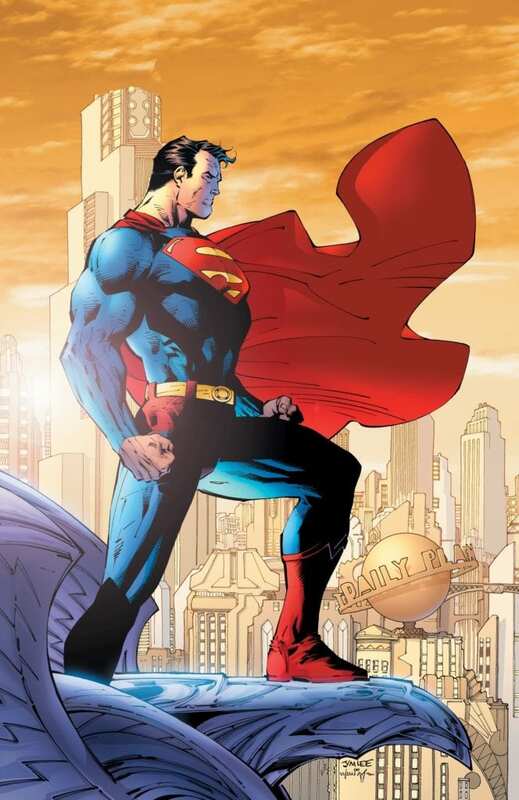 In his earlier days, Superman was able to move faster than any normal man, but he wasn’t breaking any sound barriers either; over the decades his speed was just one of his many powers to grow exponentially, with him being second-to-none against other characters with the power of flight (though many issues have suggested that his cousin, Kara Zor-El, Supergirl, might be a bit faster but we’ll forget about that for now). On the ground, and in terms of pure overall speed, he loses that notch on his belt. According to Williamson, “The Man of Steel is unmatched when flying in the air, able to arrive and save the day in the blink of an eye. But once he puts those two feet onto solid ground he can’t quite crack the top three.” Since 2009, there have been multiple instances of Supes being speedy but unable to catch up to the fastest speedsters out there in the DCU. 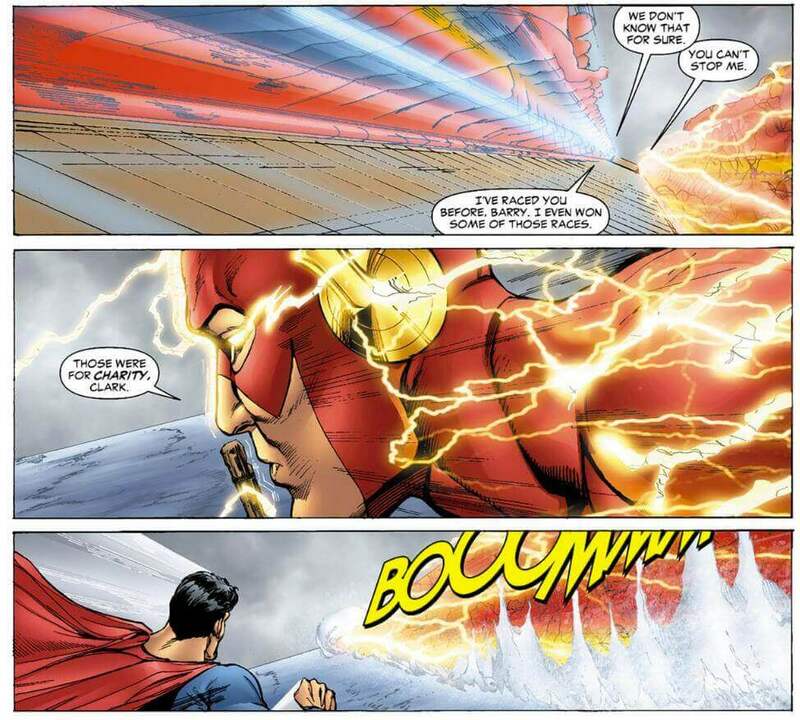 Barry Allen’s dusting of Clark in The Flash: Rebirth is one such case, but most recently, during the Flash War event, Superman attempts to catch up to a racing Barry and Wally and quickly gives up after realizing there was no chance of him reaching the two Flashes, telling his fellow Justice League members that they were moving far too fast for him to keep up. So Supes is definitely fast, but he’s not Flash Fast, and that is a Flash Fact!